Miami native Danny Smith is most remembered for his outstanding performance during the College World Series, where he helped lead Hurricanes to their first baseball national championship and earned the Most Valuable Player award. But the four-year letter-winner has many more achievements to his credit. As a relief pitcher, Smith was 22-7 with 19 saves (second in UM history) and a 2.64 ERA. He is also Miami's all-time leader in appearances with 123 and relief appearances in a career with 112. Smith who was a Baseball News All-American in 1982, seemed to have a knack for coming in and shutting down opponents whenever asked to. He will always be remembered for his scintillating performance in Omaha, where he appeared in all five of Miami's CWS contests, pitching 10 2/3 innings, giving up only two runs and striking out 13 batters. 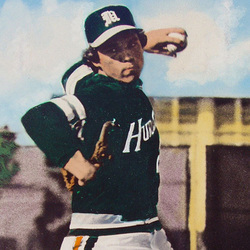 Smith would then take his talents to the next level, as he was drafted by the Cincinnati Reds in 10th round in 1983. Smith currently resides in Miami, where he is a Florida Highway Patrol officer. However, Danny Smith will always be best remembered for what he and his teammates accomplished for one week in Omaha in 1982.